Glicerio Chaves Hornero started his company in 1983, building classic bedroom furniture, in a 500 square-metre warehouse. In 1990 they moved to the current premises, in the municipality of Almagro and Bolaños de Calatrava, in the Mancha region. The company has been constantly growing from that moment onwards. It currently boasts 330 employees and a yearly turnover of over 50 million Euro. 95% of sales are in Spain, through furniture shops and hypermarkets, and its exports are growing in certain nearby markets, such as France. Having created the prestigious brand Formas, Glicerio Chaves Hornero is currently the leader and point of reference in the youthful and dynamic furniture sector. And naturally it could only be another point of reference of the sector, SCM Group, that accompanied the company towards its success. “Through its representative for the Castiglia-La Mancha region, Miguel Angel Marqués, SCM has always provided skilful and unbiased consultancy with great professionalism”, said Angel Chaves, the current managing director of the company based in Ciudad Real, who welcomed us at the factory, with his usual courtesy and attention. Glicerio Chaves Hornero currently builds furniture for about 7,000 rooms per year. 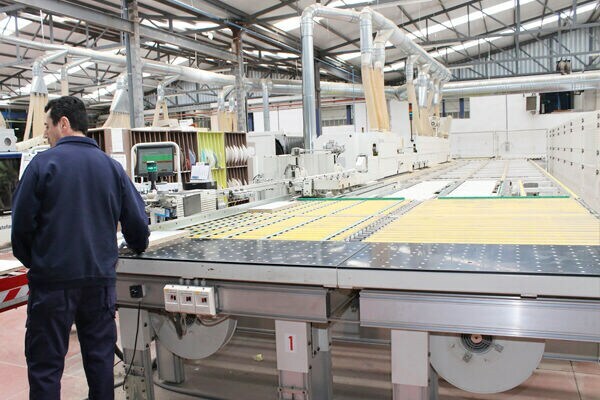 Many pieces of furniture are custom made and, to meet this demand, it requires fast and versatile machinery, with a large production capacity as well as great flexibility. The company builds large batches and single batches, based on weekly programs. 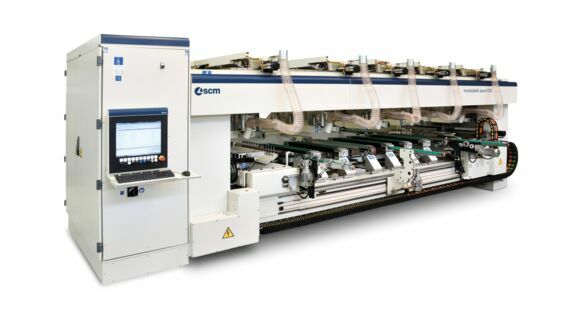 SCM sold the company the first stefani “Tandem” line, for the continuous application of edging to chipboard panels. This extremely flexible composition allows for the fast and effective construction of batches, that can also consist of just one piece. Currently the factory has three such lines. “SCM has responded to our production requirements with utmost competence”, recalled Angel Chaves. “This was a crucially important aspect for our company, to be much more competitive on the market”. These lines are able to manufacture batches consisting of just one piece, on which it is possible to create different pieces, one after the other, of various colours and measurements. STEFANI’s “Tandem” lines allow the furniture to have a very important added value, as all the pieces that come out of this plant are perfectly square. This ensures that there will be no surprises during assembly and instalment of the furniture. Starting from a first mechanical morbidelli author 504 machining centre, Glicerio Chaves Hornero, todays boasts over 20 SCM CNC drilling and boring machines. 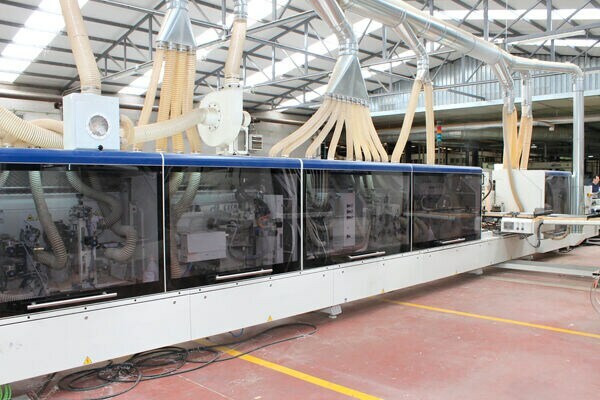 It is about to take delivery of the most powerful model of the range, a morbidelli pwx100 (powerflex before rebranding), once again confirming its trust in SCM’s technology. “We rely on SCM because of the magnificent response that we have always received. They have never disappointed us”, concluded the Managing Director of Glicerio Chaves Hornero”. “They listen to us and develop the machines that we need to keep growing and improving”. 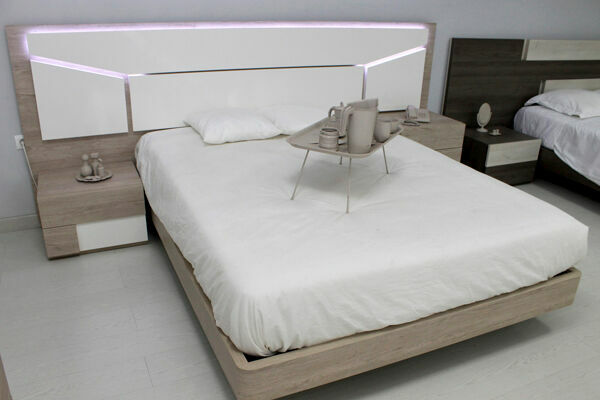 Glicerio Chaves Hornero sets the standard on the Spanish market for modern and youthful furniture, with its famous FORMAS brand, that includes wardrobes, tables, drawers and cupboard doors, desks, bunk beds, beds with drawers, etc. All the furniture is highly configurable to allow for the maximum adaptability to the customer’s requirements. In 2000 it began producing furniture for double bedrooms again, creating the “Eos” and “Basic” products. The range was completed with a line of furniture for new-born babies, for a total of almost 10,000 articles. In Spain the future of this sector means exporting to other countries. Glicerio Chaves Hornero intends to create product lines that are suitable for export, as well as becoming the point of reference in Spain. “20% of our orders are special”, explains Ramón Ascarza, Technical Office Manager. “Starting from the standard model, selected by the final customer and bearing in mind the specific aspects of the space or the composition, we treat the furniture uniquely and exclusively for the specific project, to achieve a completely customised solution”. The Glicerio Chaves Hornero products excel for their extremely competitive price, high quality and contemporary and modern design. The delivery times are within 30-35 days. Every two years the company updates its catalogues. “We try to remain constantly in step with market trends”, concludes Angel Chaves. “We have a great capacity for responding and a talent for being constantly updated. Just like SCM Group. Because we have the responsibility of setting the standard for the industry”.